The main difference between Chromebook and Laptop is that Chromebook is a laptop or tablet that runs Chrome OS as the operating system while a laptop is a small scale, portable personal computer. A computer is a vital digital electronic device. There are various types of computers, and Chromebook is only one type of them. A Chromebook is a laptop. Chrome OS is the operating system of Chromebook. This OS relies on Google based services such as Google Docs and Gmail. Most operations of the Chromebook depend on the browser. Therefore, the user can download the required apps from Google store. One advantage of this device is that data will save to the cloud rather than on the machine itself. It eliminates the virus threats of saving data to the device. A Chromebook is lightweight and thin. Furthermore, it is light in design and functionality. There are at least two USB ports, SD card slot, HDMI and audio ports. It also supports wireless technology, Wi-Fi and Bluetooth connectivity for Bluetooth devices. Usually, Chromebook carries a lightweight workload. Therefore, the processor consumes a minimum current. It can work around 8 to 9 hours without connecting to an external power supply. Overall, a Chromebook has the same functionalities as a laptop. At the same time, it works with apps similar to a smartphone or a tablet. Moreover, it is more suitable for day to day activities such as browsing the internet, watching HD videos, etc. The functionality of a laptop is similar to a desktop computer. But portability is its main advantage. Therefore, the user can easily fold and carry it with him wherever he goes. There are various laptops available in the market with different processor speeds, memory capacities, different models, and prices. Samsung, HP, Acer, Asus are some examples of laptop brands. Laptop consists of features such as keyboard, hard disk drive, display screen, processor, memory etc. Latest laptops also have a touchscreen that works according to human gestures. It is possible to power a laptop using the internal battery or by connecting it to an external power supply from an AC adapter. 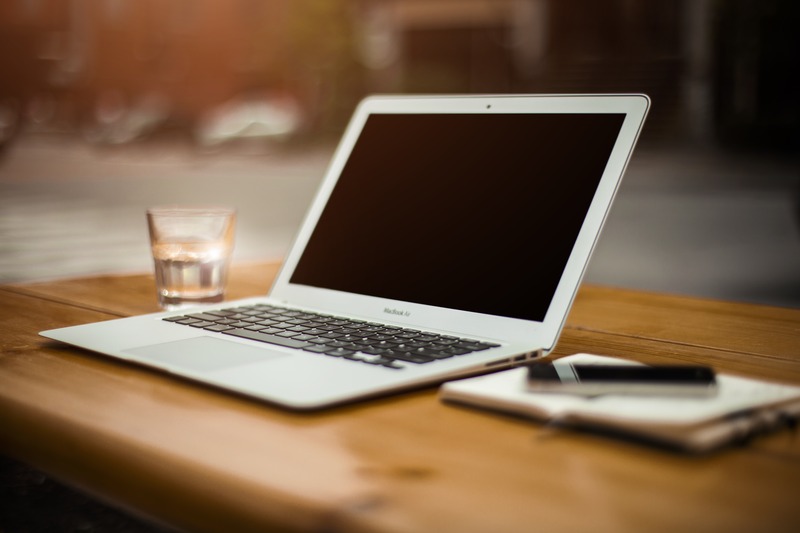 Overall, a laptop is appropriate as a general home computer as well as for office work. Users can install and run various programs and even perform complex business-related tasks using a laptop. It works as an educational tool, provides multimedia facilities, allows browsing internet, handling client details, developing software applications and many more. 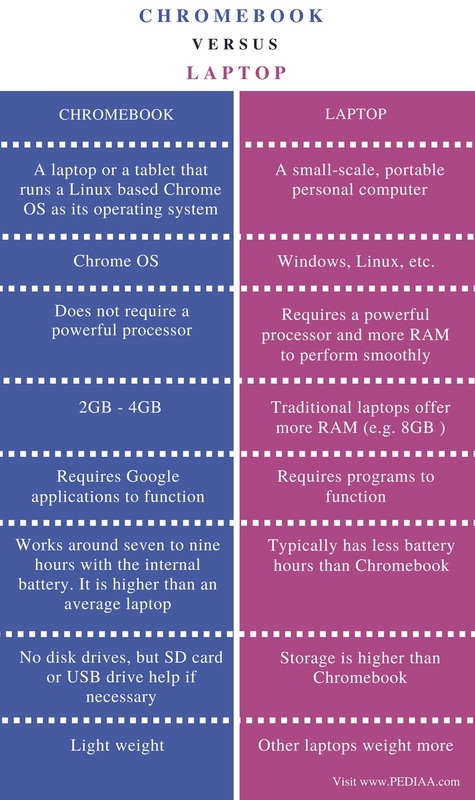 The difference between Chromebook and laptop is that Chromebook is a laptop or tablet that runs Chrome OS as the operating system while a laptop is a small scale, portable personal computer. If the user wants to buy an affordable laptop to handles the basic operations, he can choose Chromebook. If it is necessary to install and run programs, then the better option is to purchase some other laptop. 1. JimsReviewRoom. 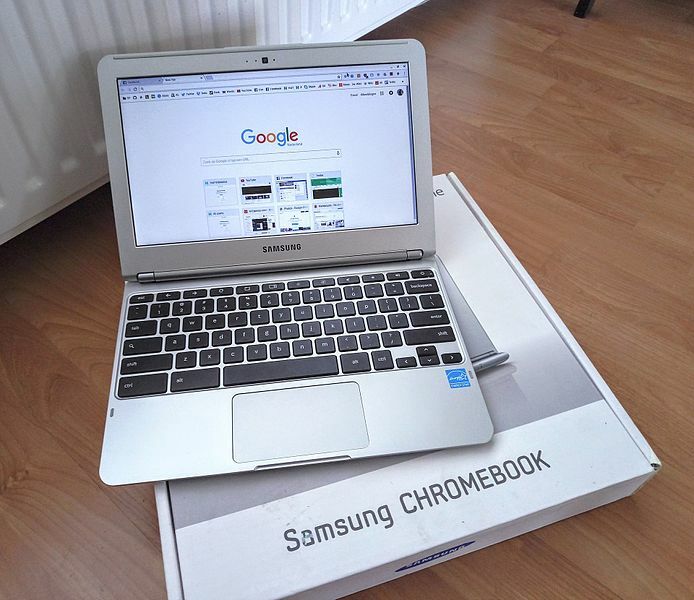 What Is a Chromebook – Explained, JimsReviewRoom, 7 Feb. 2014, Available here. 2. “Chromebook.” Wikipedia, Wikimedia Foundation, 7 May 2018, Available here.